Doret made international headlines in 2007 when he was selected to design the interior of the first Airbus A380 purchased by a private client. We live in a world where luxury abounds, where having one home, sometimes two, seems insufficient, and where modes of transportation are no longer limited to Lamborghinis and Bentleys, but now include private yachts and jets. What once were thought of as toys have evolved into necessities, transforming the globe into a playground for the rich and fabulous. Grandiose as these utilities may appear from the outside, it is the interiors that are pushing the envelope of luxury to new heights. 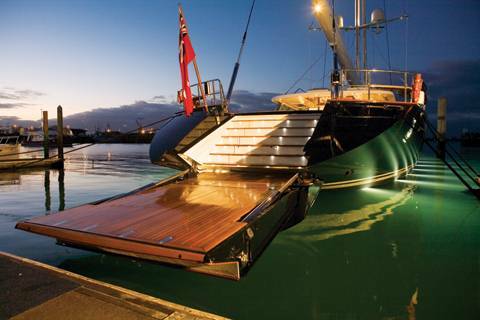 Needless to say, talented artisans to fill private travel vessels with sleek sophisticated style are in high demand. Though there are many who boast their abilities to manifest an Airbus’ interior into a haven of luxury, only one man creates sheer sophistication in each and every project: Edése Doret. A native to Haiti, Doret migrated to the U.S. at a young age with his family and was raised in the Bronx. Always having an eye for detail and a fervent perfectionist, he chose to attend the High School of Art and Design on 57th Street, where he focused on industrial design. It would seem that fate brought the young Doret to the city, as it is a metropolis of artistic cultivation and the perfect environment to foster young new talent. Doret furthered his education at Pratt University and graduated with a bachelors in Industrial Design in 1991. He was quickly recruited by a design firm to aid corporate brands such as AT&T and Sony, and also delved into interior design for Walt Disney World. After gaining vast experience in an array of interior design fields, he went to work for a firm developing jet interiors as a senior advisor, and found his passion. Soon after, he established his own design firm, Edése Doret Industrial Design, Inc., in 1998. 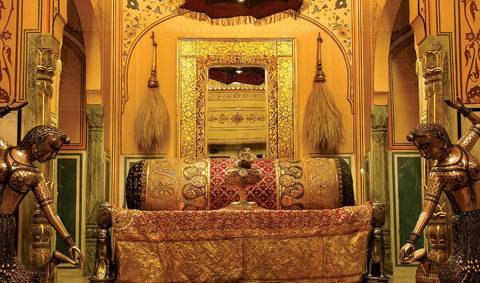 Since its inception, the company has been a leader in the world of jet interiors. EDID is listed by Boeing as a qualified designer for the BBJ and BBJ2, and has developed interiors for a plethora of private jets including Airbus, McDonnell Douglas, Lockheed, and others. Doret made international headlines in 2007 when he was selected to design the interior of the first Airbus A380 purchased by a private client. Doret spent two years finalizing the plans for the double-decker aircraft. The interiors created by EDID certainly fulfill their own objectives, so it comes as no surprise that the company has cultivated a following of elite clientele. Doret’s work is brilliantly chic, giving the visage of modern sophistication rarely found in jet interiors. 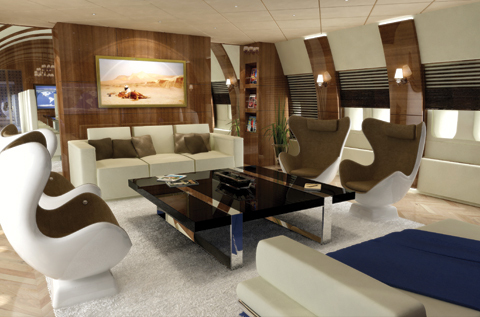 One of his latest projects, the interior of an impressive Boeing 747-8, is a prime example of his intrinsic tasteful eye. The private aircraft is now a modern oasis of serene chic. Upon entrance, flyers step into a sitting room with cream couches and chairs, all strategically placed to encourage conversation. A chaise beckons guests to relax and enjoy the in-flight experience. Doret plays with shape in the space; the square edges of the couch and coffee table compliment the roundness of the chairs, bringing the space together harmoniously. The organic wood, cream color palette, and furniture is thematic throughout every room of the aircraft, with small modifications to accent the individual feel of each room. A stunning glass and wood staircase leads down to the bar area, which houses more retro-inspired rounded chairs. A zebra patterned carpet sprawls amongst the chairs while a Venetian glass chandelier hangs discretely over the bar. Dark wood encases the walls and beams, resulting in an ambiance akin to an urban lounge. The main deck is home to one master and two guest bedrooms, each of which Doret has adorned with creative details such as quilted walls, venetian glass, and understated wall lighting. With unparalleled creative design and management, Edése Doret has dominated the interior jet industry, for one simple reason: Doret’s designs transform a sky-high journey from a hassle to haute.